True to my word, here comes a book review. 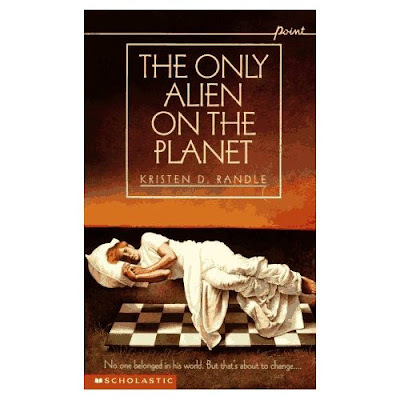 The Only Alien On The Planet authored by Kristen Randle is my favourite book. Period. This is one book that I totally connect with. It's such a beautiful story that seems to go right to your heart. It's woven around a 16 year-old girl Ginny Christianson whose family decides to move to a new place all of a sudden. She loves her family comprising of three brothers and her parents but Ginny feels totally alienated in the new environment, the new place, new school and new house. She misses her brother Paul who's left for college, she misses being with her parents when they're busy setting up their new office, she misses her old life. But then she's soon friends with Hally and her neighbour Caulder Pretiger. And she also meets someone who seems even more of an alien, Smitty Tibbs, the guy who's got the best brains, and is really charming, but the guy who doesn't talk, who doesn't react, who doesn't interact, who is bullied by other students until Caulder stops them, and who just seems like he's in an altogether different world. The story goes on about how Caulder and Ginny befriend Smitty, the truth about what lies behind Smitty's indifference and strange behaviour, how it is unraveled and how they end up as a big happy family together. This book had lied with me for about 4 years before I read it. My brother had brought it for me when I was in 5th standard(around 10 years old), but at that time I had been completely into Enid Blyton and Nancy Drew and Hardy Boys and I didn't really like the starting and I had just left it! I picked it up once again when I was in 9th and after I read it, I just fell in love with it. Every time I read it, I like it even more. I would strongly recommend evrybody to read it atleast once in their lifetime. nice review! im in 9th presently. will surely check this one out!